New Orleans was wonderful, though not good for my waistline or my writing. My favorite t-shirt seen in the tourist shops: What goes down in Vegas stays in Vegas. What goes down in New Orleans, you go home and brag about! My favorite restaurant: R’evolution, and the always-wonderful Court of Two Sisters and Commander’s Palace, though I can honestly say we didn’t have a bad meal the whole time we were there. Loved the football game and the paddlewheeler cruise to the Chalmet Battlefield (Battle of New Orleans). And now to get back to work. 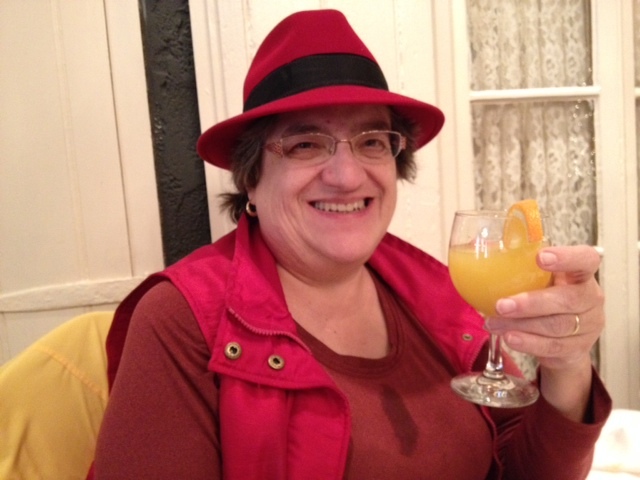 Me in my new red hat, with a mimosa, at the Court of Two Sisters for brunch. Checkup today with the orthopedist to see how my arm is doing. The x-ray shows complete healing. Plus I’ve got most of my range of motion back. Still need to keep working on the rest of it, but I don’t need to go back for any more followup. Hallelujah!